ISLAMABAD: A day after a senior official of National Accountability Bureau made TV appearances and leveled allegations, the opposition parties moved a privilege motion in the National Assembly on Friday. Citing a breach of the privilege of the members of the opposition in the NA, the motion objects to the “media trial” of the opposition members and urges “immediate intervention” of the House. 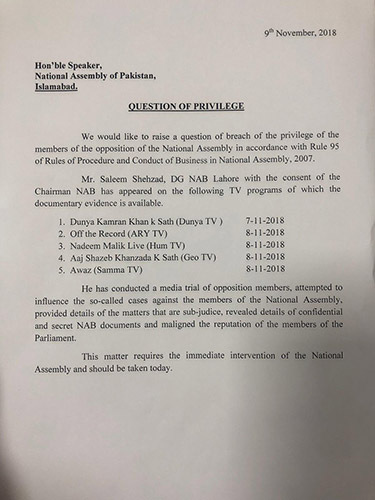 A privilege motion was submitted by the opposition parties on Friday to the National Assembly Secretariat where a ‘media trial’ was brought to notice by National Accountability Bureau’s Lahore Director Genera Saleem Shehzad. “We would like to raise a question of breach of the privilege of the members of the opposition of the National Assembly in accordance with Rule 95 of Rules of Procedure and Conduct of Business in National Assembly, 2007,” read the motion. It further mentioned that Shehzad had given interviews to various interviews on multiple private news channels where he breached the confidential matters of the bureau’s secretive documents and tainted the reputation of parliament members.